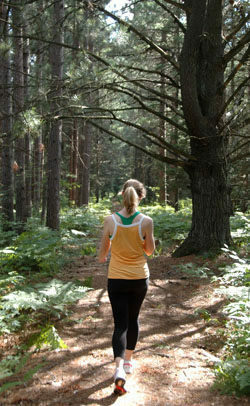 Named from an early logging railroad spur, Mertz Grade Trail is a 2-mile plus loop that extends on both sides of M-93. A portion of the trail follows the historic Mertz logging railroad spur and on the west side of M-93 you pass some impressive white pines. There are also 17 numbered posts that correspond to an interpretive brochure available on this web site or from the Michigan Forest Visitor Center. But overall this foot path is not nearly as interesting a hike as the Au Sable River Trail just to the north of it. At times you find yourself walking through a matchstick stand of aspen. Nor do you ever see Hartwick Lake. The spur that many park maps show extending to it is almost impossible to locate while the shallow, marshy lake is of little interest to anglers. From the south end of the parking area in the picnic area a spur near the old logging museum leads to the Mertz Grade Trail, reaching it just past post No. 17. 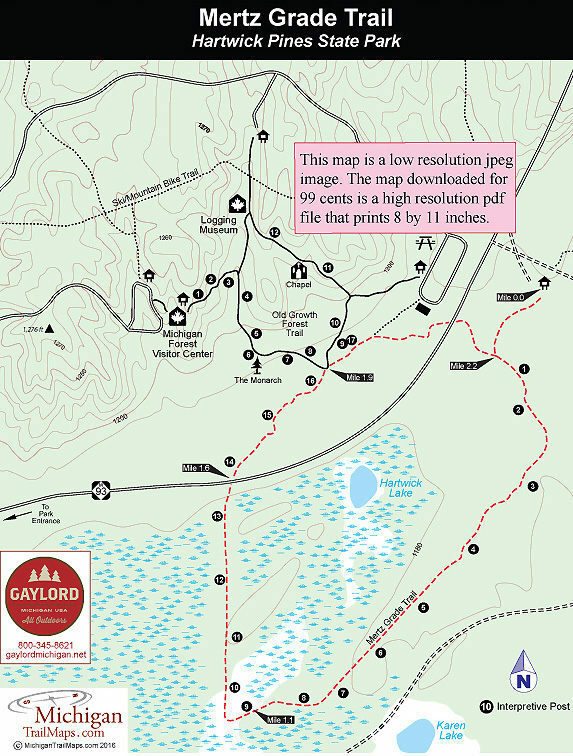 This description begins at the trailhead and parking area on Bobcat Trail. From the Bobcat Trail parking area the Mertz Grade Trail crosses the paved lanes of the park’s former campground to quickly reach a trail sign for the Mertz Grade Trail. Head left here to follow the posts in their correct numeric order. At Mile 0.7 the trail takes on an appearance of a railroad bed, an arrow-straight path that is lined by some large white pines. Post No. 9 and a bench is reached at Mile 1.1 and here the trail swing to north and enters a young growth of aspen. It is along this stretch, near Post No. 13, that the trail follows the former Mertz Grade railroad spur. M-93 is crossed at Mile 1.6 and the trail then enters a beautiful, old growth forest featuring many towering hemlocks and pines. At Mile 1.9 the Merge Grade Trail merges briefly into the Old Growth Forest Trail at a spot where there are benches and an interpretive display. Mertz Grade splits off as a paved path and leads to the former museum, a still impressive log building, before swinging east and arriving at M-93 for a second time. On the other side of the state highway you’re only a few steps away from the trail sign passed early in the hike. Head left at it to re-cross the old campground and return to the Bobcat Trail parking area at Mile 2.3. There is no drinking water or other facilities at the trailhead. The park is open year round, offering Nordic skiing in the winter, and a vehicle permit is required to enter. 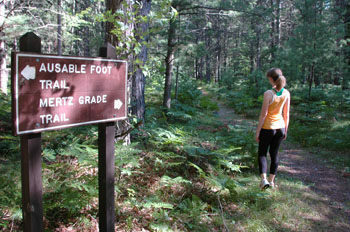 Mertz Grade Trail can be picked up from Hartwick Pines picnic area or the trailhead along Bobcat Trail that also serves as the start of the Au Sable River Trail.